KNOXVILLE, Tenn. (AP) Tennessee understands the skepticism that continues to surround this program, even though the Volunteers feel much more optimistic about their own prospects. For the second straight year, the Southeastern Conference’s preseason media poll projected Tennessee to finish 13th out of 14 conference teams. The Vols realize the doubts about their team will linger as long as they keep missing the NCAA Tournament. Tennessee actually outperformed that prognostication last year, but a late-season fade caused the Vols to finish 16-16 and ninth in the league. Tennessee hasn’t had a winning season since reaching the Sweet 16 in 2014 . The Vols believe that will change this year. Tennessee showed promise last year by beating Kentucky at home and coming within two points of eventual national champion North Carolina at Chapel Hill , but the Vols staggered down the stretch. The Vols are counting on improved depth and experience to make a difference this year. Vols coach Rick Barnes enters his third year on the job with a roster that he believes is the deepest of his Tennessee tenure . Tennessee returns five guys who played at least 19 minutes per game. That list features sophomore forward Grant Williams , who averaged 12.6 points and 5.9 rebounds last season to make the coaches’ SEC all-freshman team. The Vols also added three true freshmen plus Howard graduate transfer James Daniel III and Vincennes (Ind.) transfer Chris Darrington. ”Practices have been more competitive, and that’s what we wanted,” Barnes said. Some other things to watch with Tennessee this season. CROWDED BACKCOURT: The addition of Darrington and Daniel add depth and experience to a backcourt that was inconsistent last year. Darrington was Tennessee’s top scorer in its summer exhibition tour of Europe. Daniel averaged 27.1 points at Howard two seasons ago to lead all Division I scorers. Their arrival has created competition that has brought out the best in Bone, who had an up-and-down freshman season. Jordan Bowden and Lamonte’ Turner also return after earning ample playing time last season. SCHOFIELD’S NEW ROLE: Tennessee’s lack of height has caused Schofield to spend plenty of time in the paint his first two seasons, but the 6-5 junior figures to be more of a wing this season. Schofield says it hasn’t been much of an adjustment and noted he was recruited to be more of a wing before circumstances moved him inside. 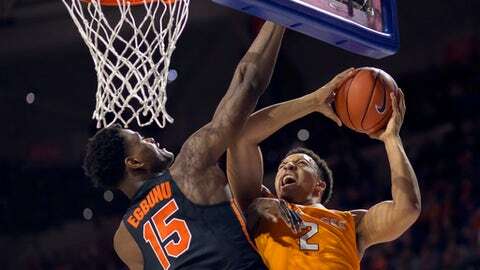 WILLIAMS’ RETURN: Tennessee’s chances of competing for an NCAA berth depend in part on whether Williams can take the next step in his development and emerge as an all-SEC candidate in his sophomore year. Williams, who is 6-7, had Tennessee’s second-highest scoring average last year and led the Vols in rebounds and blocked shots. A LITTLE MORE HEIGHT: A lack of height has been an issue for Tennessee lately, but the Vols will have a little more size surrounding 6-11 junior Kyle Alexander this year. Tennessee’s freshman class includes 6-10 Zach Kent, 6-8 Derrick Walker and 6-5 Yves Pons. The Vols also are looking forward to the return of 6-9 redshirt freshman John Fulkerson, who played just 10 games last season before dislocating his right elbow and fracturing his right wrist. ACC FLAVOR: Tennessee’s nonconference schedule includes three dates with Atlantic Coast Conference schools. The Vols visit Georgia Tech on Dec. 3, host North Carolina on Dec. 17 and play at Wake Forest on Dec. 23.